Good lord that is some amazing country. It’s not cheap, but I’d recommend it to anyone who might be on the fence about it. It’s been just over a month since we went, and I’ve had parts of this post(s) ready pretty much the week we got back, but I wanted to make sure I didn’t short change anything, though that would be impossible on a trip like this. There was so much to see that I felt like I wanted to open my eyes wider in an effort to get as much of the scenery into my brain, my body, my soul. Day 0 (Saturday) – Seattle – We got into Seattle late on Friday night. Basically got off the plane, and then tried to figure out the best way to get to the hotel. A taxi would have been $50 (to give an idea of distance from airport to downtown Seattle – it was a solid 30+ minutes on their light rail. However, the Light rail (honestly it was basically their subway system) only cost $3 per person, so I felt that was a win right out of the gate. But there was a catch… the Light Rail station was FOREVER away from our bags. It became this joke as we hauled our luggage out into the parking deck area. Signs telling us that we were on the correct path gave us reassurance that it would only be around the next corner, or possibly the one after that, or finally down this even longer walkway. Maybe the actual city is even further away, but we just walked the first part? On Saturday we met up with my parents (who were accompanying us on the journey) and then my former roommate Andy Hickson and his wife Jamie acted as our tour guides the rest of the day (given that they’ve lived in Seattle for the better part of 15 years now… I think that’s right). We did Pike’s Market and watched them throw fish (and almost hit a bystander which would have made for a better story), we went on the Underground tour and learned about the history of the city – apparently Seattle burned to the ground and they decided to raise the city up about 15 feet, so they created a series of of retaining walls and then filled the streets in (https://en.wikipedia.org/wiki/Seattle_Underground)... I’m not trying to get into the weeds with it, but it was definitely a clever way to fix their potential flooding problems at the time. And as a guy who designs roads during the day, it scratched that engineer itch. They even got me to ride the Ferris Wheel (I’m not big on heights). Day 1 (Sunday) – Got to the ship. For some reason we didn’t leave the port on time… technically they did come over the loud-speaker to say why… but the Captain was the most mono-tone person I’ve ever heard. And the way he talked, well the only way I know how to describe it is that he spoke as if sentences did not have spaces between words. It wasn’t quick talk, but somehow I couldn’t tell where one word began and the next one ended. All I could figure out was they would have to burn a little more fuel (go faster) to ensure we got to Juneau on time come Tuesday). All I have to say is for Sunday night and almost all day Monday the boat was rocking. Not sure if it was because of that delay in leaving Seattle or if there were bad storms somewhere just over the horizon (and that’s why we delayed in the first place). What I do know is that if I hadn’t had the patch I would have been screwed. As it was there was a couple of times that I had to kind of refocus due to the up and down of the ship. And many times walking had you doing that half-drunk thing of needing to recenter yourself. Otherwise you’d end up like more than one person I saw who used both the right and the left walls to try and steady themselves as they moved down the hallways. I don’t want to make it seem like we were in 20 ft swales or anything, just that those two days were not “smooth sailing” by any means. Day 2 (Monday) – At Sea – So it was mostly eating various meals, getting a low-down on where everything was on the ship, going to a show that night, and hitting the casino to play some Blackjack and Poker. Sadly I don’t have any tales of how I paid for the trip or anything. The House took my money and my wife’s money throughout the course of the week. Day 3 (Tuesday) – Juneau – Found out that the only way into Juneau is by air or by boat due to the fact that there is a huge sheet of ice preventing any rail or roads from reaching the place. Coming from Atlanta where we live on our interstates, that is a weird one to be sure. We went on a wilderness (there’s that rainforest word again) hike. Then went on a whale-watching boat tour. Saw so many bald eagles. So cool. Saw humpbacks not 25 ft from the boat. And there was that cool moment/thought that both our guide and the Boat Captain had genuine excitement when the humpbacks would pop up. 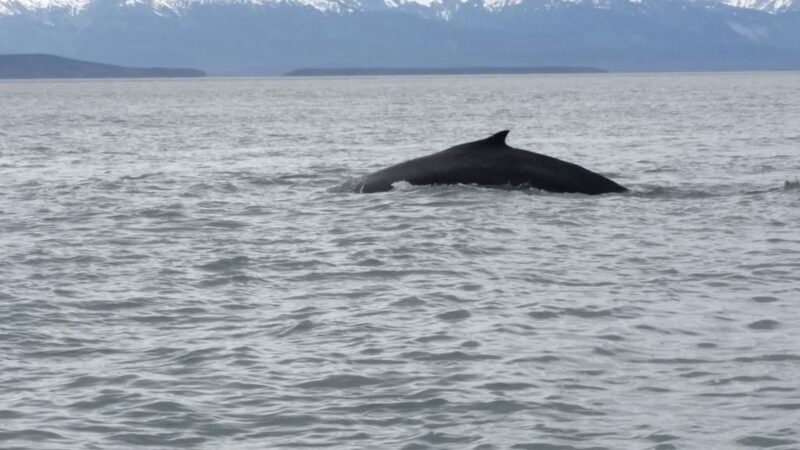 Especially when you consider that they’ve probably seen hundreds if not thousands over the years, but I have some video where the whale comes up and the tour guide’s voice can be heard above most of the other passengers. Aside – All of our tour guides were from other places and spent the summers up in Alaska doing the tour guide thing or whatever… you know, it never occurred to me that such an option was out there while I was in college (not saying I would have done it, but more that it never passed through my brain). This particular guide basically followed the whales from Hawaii in the winter to Alaska in the summer. That’s not too bad a life. There is much, much more, but I’ll save that for next week. Tagged Alaskan Cruise, Bald Eagle, Humpback Whales, Juneau, Seattle.